Cordoba is ideally placed between Seville and Granada to be a great port of call when traveling around Andalusia. Its Mezquita (mosque) is one of the largest in Europe. Cordoba can be visited as a day trip from Seville or Granada. 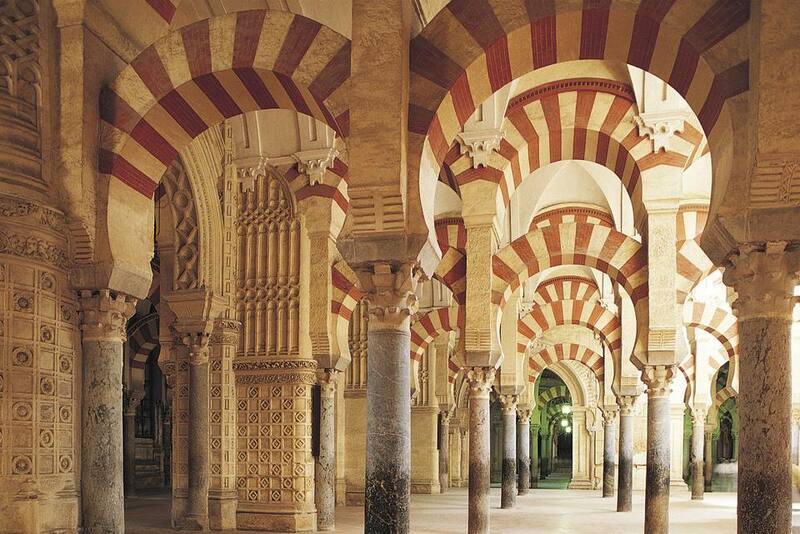 But why not consider basing yourself in Cordoba for all your Andalusia explorations? Cordoba is the nearest of Andalusia's biggest cities to Madrid and is well situated for visiting Seville and Granada. May. The month begins with the Cruces de Mayo (May Crosses) Festival, followed immediately by the Patio Festival, both of which feature the city splendidly decorated. Towards the end of the month is the Cordoba festival. Alternatively, fans of six-stringed instruments should go to the Cordoba Guitar festival in July. Guidebooks describe Cordoba as 'provincial,' but the six-lane highway that leads into the city would have you believe otherwise. Certainly parts of the city are provincial, but you won't see anything but a bustling city as you come into the city. Cordoba is the perfect size for a walking tour. Your Guide will show you the most important sights in the city in under four hours. And with the tour running in the morning, it gives you the perfect introduction to the city before you spend the rest of the afternoon on your own. The bus station and train station are side by side, which is convenient, and from there it is a 15-minute walk to downtown. The main square is Plaza de las Tendillas. However, nothing is exciting about this part of the city - all very commercial with big department stores and little else. For the nice side to Cordoba, take a cab to Plaza del Potro (made famous by Cervantes's Don Quixote) in the old town, where you can start a pleasant walk up to Mezquita through streets that are more reminiscent of a seaside village than the center of a city. From here it's a short walk to the Mezquita - take a deep breath before you enter the chaotic environs of the area around the mosque as hundreds of tourists threaten to spoil the beauty of the Moorish monument. Do they succeed? No, it is still a very pleasant area to be in, especially the orange grove inside the walls of the mosque. Once you've finished with the mosque, walk up through the old town, with the numerous handicraft shops (all locally made), up to the Jewish quarter. For hotel reservations in Cordoba, an excellent, easy-to-use site is Venere. They have hotels for all budgets and a clutter-free website. For a budget-priced bed in a dorm, try Hostelworld. Another great option is to rent a private apartment from Airbnb. The Mezquita, the biggest mosque in Spain. It is still in use. See the orange grove behind the Mezquita. The botanical gardens, including the ethnobiological museum (which investigates the link between man and plant) and the pinsapo Spanish fir, a rare tree indigenous to the area.